Sounds fabulous. Saved on del.icio.us! this is the kiddie version. Sprinkle with korean pepper flakes! It's sold as ground korean pepper in korean grocery stores. 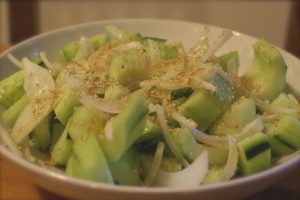 I love cucumber and I just mix it with vinegar and salt. You have a different style and I will probably try it. Thanks for sharing. This sounds great. I'm looking for some more side dishes with fresh veggies. Yum!